Being the complete footballing saddo I a m, I always sit down and watch sky sports on a Saturday morning to catch up with team selections for my fantasy football team, while at the same time listen to all the pre-match managerial interviews for the weekend…happy days! As soon as I switched on the tele this morning they’re talking with Harry and Pards,the timing couldn’t have been better cos we’re shooting out early today for a wedding. Unfortunately, for me I was mid-sip of a monster cup of tea mixed in with a slice of hangover toast as he said that, the cat is now suffering third degree burns and has spent the last hour licking all the bits of toast out of its fur. I went back in the kitchen, got another cup of tea, put some more toast in the toaster and then sat down again and turned on the computer to look at the Newcastle united blogs I like to read. 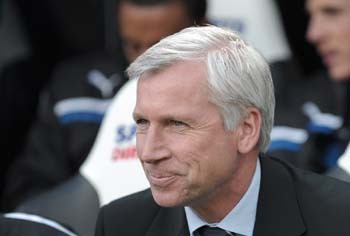 NEWCASTLE BOSS PARDEW SETS SEVEN POINT FESTIVE TARGET!!! Happy days! 7 points from the next four games and we’ll be right back up there challenging for Europe again. All we have to do is beat QPR today, then beat either Arsenal or Man U away or beat those relegation pushovers Everton at home and then get a draw from one of the rest…easy peasy when you look at it look like that! How many points do you think we’ll get from those 4 games?